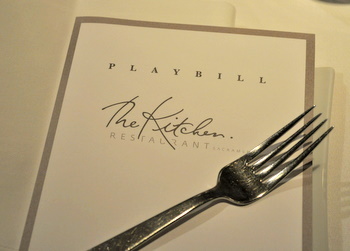 The Kitchen restaurant has one seating per night with just 50 diners. It serves one menu – which changes each month and features seasonal, mostly locally produced ingredients – and a unique dining experience along with it. The kitchen of the restaurant is entirely open and guests can walk in to the back, into the pantry, into the wine cellar and even into the walk-in. 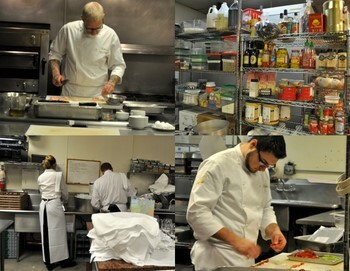 Part of the kitchen is in the dining room, where food is prepped, cooked and plated right in front of the guests. Most patrons are arranged in a large U-shape around the prep area and there are a few tables available, as well. I know that some reviewers have described this as dinner theater, but it is really just great cooking, great service and one of the most interesting dining experiences you can have (especially if you’ve never seen a pro kitchen at work before). I visited The Kitchen last weekend. The menu was six courses, including a white glove tea service, and there was in intermission of sorts half way through the meal where we were served sushi. Chef Noah Zonka stepped up to the stove to introduce the staff of the restaurant and the menu for the evening, which had a walnut theme to it because the California Walnut Board was promoting walnuts during their harvest season. He was a very animated speaker and was extremely enthusiastic about the menu he had put together, as well as the ingredients that he was using that evening.Â It was a fantastic introduction to the food because you don’t often get to hear as much about where the ingredients come from as we did from Chef Noah. 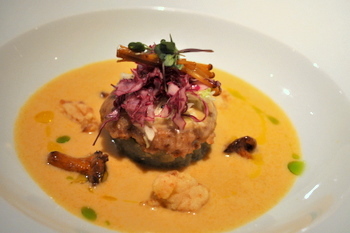 The first course was a Thai-Style Coconut Milk Soup with Wild Frog Legs, Mushrooms, Cabbage Slaw, Walnut Bread Pudding and Bamboo Rice Cake. Really creamy and fresh-tasting, this was a great soup as well as a great starter. The frog’s legs were cut into small pieces and deep fried in a tempura batter. I’ve never had frog’s legs before, but I have had alligator, and I have to say that they had a similar flavor. 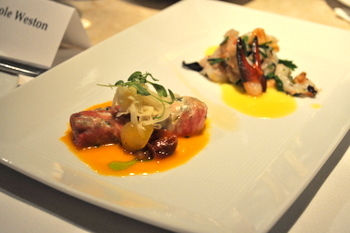 The second course was a “burrito” of Waygu Beef, Eggplant and Goat Cheese with a Walnut-Herb Crayfish Salad. The “burrito” was a roll of beef carpaccio, stuffed with eggplant and cheese. It was incredibly tender, and as crayfish are not my favoriteÂ – though the presentation with a tiny claw was beautiful – I would have taken two of the “Burritos” any day! The next menu item was sushi. 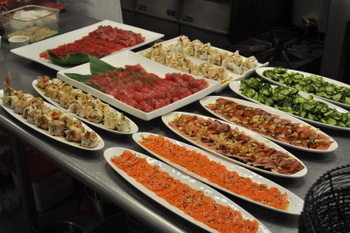 We had had time before service to walk around the kitchen and see what was going on, but during the sushi course the plates were actually set out for us in the kitchen, forcing even the most timid guests back there to see what was going on. There was some fantastic sashimi tuna, yellowtale and salmon, along with a few different rolls, pickled cucumbers and a mango-crab salad. The freshly grated wasabi root was a treat that you don’t see at just every sushi restaurant, either! I tried not to fill up on the thinly sliced, melt-in-your-mouth tuna, but it was tempting. Fortunately, the intermission was around 45 or so, so there was plenty of time to both eat and digest. 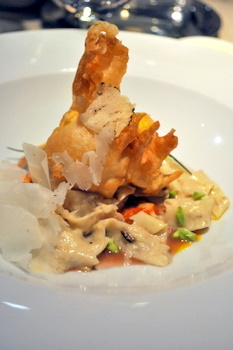 During the sushi break, the chef finished cooking the lobster for the next course.Â It was a Maine Lobster Bolognese with a Tempura-Fried Egg Yolk, Butter-Poached Walnut and Black Truffle Pasta in a Red Wine Parmesan Broth. The pasta was made just a few hours before with ground walnuts and very finely chopped walnuts for texture. You could taste a hint of the truffle, too, and the fact that the pasta was poached in butter made it very tender and delicious. 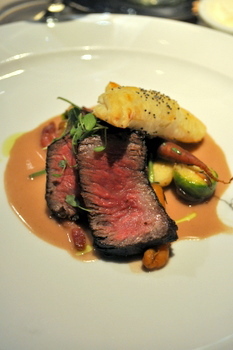 The food overall was fantastic, but the steak in the fourth course was really exceptional. I might be biased slightly because I love a good steak. It was a Classic Steak Dianne with Walnut-Peppercorn Sauce, a Knish made with Puff Pastry, Homemade Bacon and Potato, Mini Brussel Sprouts and Roasted Carrots. The Knish was also amazing. Just before dessert, they started the White Glove Tea Service. 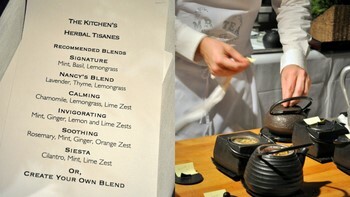 All of the teas were prepared fresh, with fresh herbs, spices and infusions. The options were overwhelming, but they had put together a helpful list of suggestions to guide you. The teas were prepared while dessert was brought out, so you had the two roughly at the same time. Dessert was as delicious as everything else. 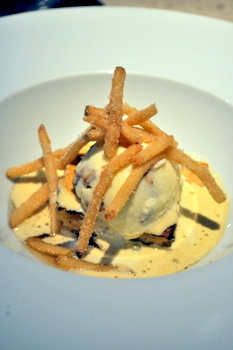 It was a Brioche French Toast with Caramelized Apple, Maple Syrup, Caramelized Walnut and Vanilla Bean Ice Cream, and Apple Fries all served with a Maple Sugar Sabayon. French toast is a breakfast favorite of mine and I would take it for dessert any time after this. 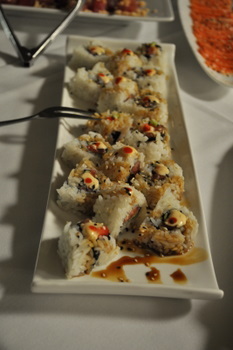 It was a great combination of flavors and you could really taste every flavor element in there. We were all full, but I think almost everyone finished their dessert. You might think that this sounds like a long dinner – and it is. The doors open at 7pm, dinner starts at 8pm and they don’t close until all of the diners have voluntarily left for the evening. In fact, if you want to stay for an extra glass of wine – or three – it is perfectly ok, even if you’re there until 3 am. My dinner ended just after midnight. This is why they only have one seating per night. But the staff is gracious and doesn’t mind socializing with the guests. And at the end of the night Chef Noah will see each and every group out to their cars and thank them for coming. 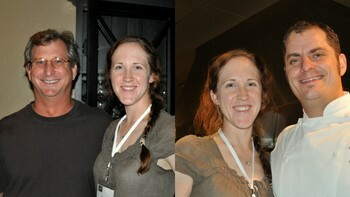 I even was able to take pictures with both Chef Randall (the owner, below left) and Chef Noah (below right). I would come back the next time I’m in town just for the food, but the attention to detail, the fun of the experience and the exceptional service make it unforgettable. 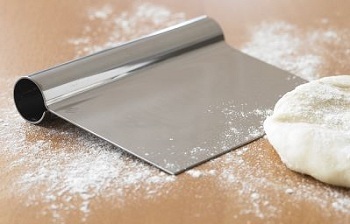 Previous PostPrevious What is a bench scraper? This makes me wish I still lived in California…or at least had a visit planned some time soon. I would love to be able to watch the goings-on in the kitchen and socialize with the staff! I’ll have to tell my northern CA family about this place. What a great concept. This is what a true dining experience should be. There are times when you want to go and eat, and talk and linger, and not be rushed to turn the table over for the crowd waiting. 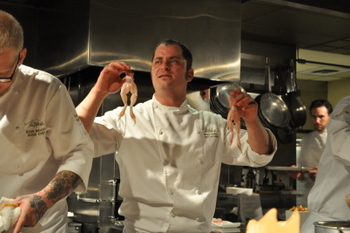 Thanks for sharing your experience, everything looked wonderful, except I couldn’t do the frog legs! I didn’t know you were in Nor Cal!!! I’m in Yolo county! Hi neighbor! I have heard about that place before, it sounds so cool! and your in Nor Cal?! That sounds incredible, and I LIVE in Sacramento! Too bad we don’t have a lot of extra money… maybe it can be an anniversary treat or something. This article makes me proud of my lil hometown of Sacramento. Thanks! 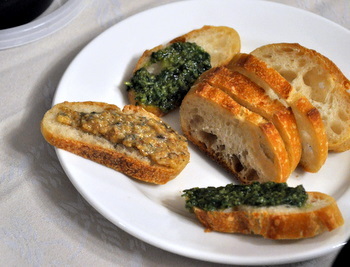 My mouth was watering as I read your article and looked at the pictures. I’m in Sacramento quite a bit, so I really should go here for a unique dining experience. I wonder if all the staff are on their best behavior since they’re the center of attention. I have been there couple of times in 2009!!! Great place, much much better than the pictures. Recommended! !